Here’s a poem that, I believe, begins in nostalgia and ends– many years later– in discovery. My records indicate that I took notes for this poem on May 25, 1998, when I was working on a prose piece about walking in cemeteries. Driving from my home in Cheyenne, Wyoming, to the ranch in South Dakota, I often stopped at about the halfway point to walk my dog in the cemeteries for the little towns of Sunrise and Hartville, Wyoming. 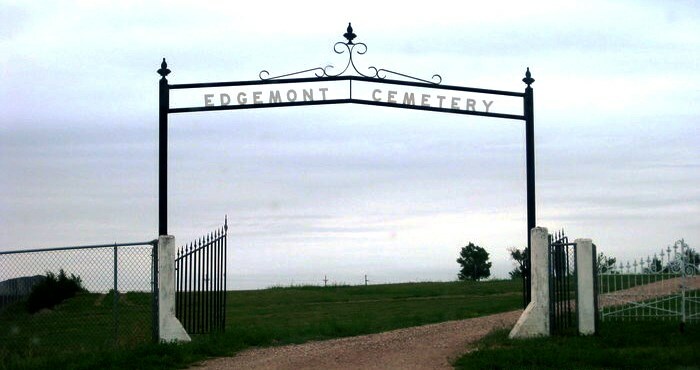 Once, deliberately, I stopped at the Edgemont, South Dakota, cemetery and realized I couldn’t recall exactly where my grandmother was buried. I spent a long time looking for her and thinking about the irony of not being able to find the ground that held this woman who was so important to me. In 2007, working from those 1998 notes, I began writing a poem I called “Looking for Cora.” Thinking about not being able to find her reminded me that every day I used objects she had owned. I took satisfaction in recalling– though it is not in the poem– that when we met in her little house to divide her belongings, some of her heirs took the most expensive possessions, like silverware and sets of dishes. One cousin and I collected humbler objects. 3 that bears her name. No need. 5 she’d stored in deep drawers. 16 to care what I smell like as I get into bed. 19 potato peeler will still hang on the wall. 24 on my cousin Sue’s left hand. That’s fine. Lines 22-23 mention Grandmother’s face in my mirror, and lines 23-24, the wedding ring that my cousin Sue wears. Because I had taken careful notes, including all five senses– sight, sound, smell, touch, possibly even taste– I was able to recreate the memory of walking in that burial ground nearly ten years later, and recall specific details of my Grandmother almost two decades after her death August 9, 1980 at age 88. Revising called my attention to other rough spots in the poem as well: the repetition of “last” in the lines 11 and 12, and the repetition of “gone” in lines 20-21. The emphasis of the poem shifts when the poet mentions being “nearly gone myself,” taking the reader’s attention away from the central figure of the poem, Grandmother, and the particulars of her life. But the poem is supposed to focus on my search for Grandmother, both literally in the cemetery and metaphorically in my memory, so although I mention my swollen knuckles in the final draft, I shift attention back to Grandmother. What changes most from draft to draft is the title– from “Looking for Cora” to “Looking for My Grandmother” in 2010 to “Looking for Cora Belle,” and back. Her melodic name was important to me, but I found myself resisting including it early in the poem. An important improvement in the revisions is in the length of each line, and thus the rhythm. The first draft, written in 2007, is rocky. First drafts should be a mess, because the intent of beginning is to collect all the impressions that come to mind when you are deciding what to write about. So I’m pleased to note that nearly every detail that is important to the final poem was already in this draft. Though the rhythm is awful, I’ve read the completed version of many “free verse” writings (I decline to call them poems) that are as bad. Apparently some novice writers think that capturing the specifics of an event on the page completes the poem. Not so. Now it’s time to work on rhythm. To demonstrate, I’ve capitalized the syllables on which emphasis falls in Lines 1-5 of this version. that BEARS her NAME. No NEED. she’d STORED in deep DRAWERS. There’s no consistent rhythm in those lines; reading them makes me grit my teeth rather than recall the woman that I knew and my reason for searching for her. I put the draft aside and apparently didn’t work on the poem again until November 23, 2010. Perhaps I returned to it then because Twyla M. Hansen and I had begun to discuss doing a book of poems together. I knew the draft had good material, but it needed serious work. In pursuing a smoother rhythm, I kept the length of time since her death “eighteen” years because the word has two syllables, whereas twenty-seven, the actual length of time she’d been gone, has an awkward four. And while it’s believable, and was true, that I was just finishing her Noxzema after 18 years, 27 might have been hard to believe. That odor is my favorite memory in the poem, sure to awaken responses in anyone who has smelled it. When I read the finished version of this poem to an audience for the first time at the 2015 South Dakota Book Festival, I was delighted to hear gasps of recognition, and see nods as women remembered Noxzema. 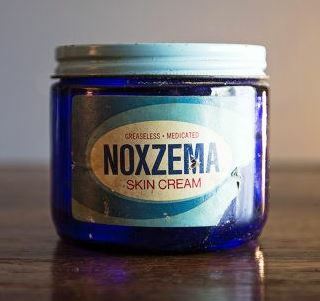 The women with hair as gray as mine laughed at the idea of smelling like Noxzema in bed, but younger women looked slightly puzzled. The tangible possessions that I’d kept as souvenirs of my grandmother’s life, such as her bread bowl and her towels, remained in all later drafts, but I took her potato peeler down from the wall and made it an active part of the poem by writing the truth: I was still using it, and one of the blades was wearing thin. Yet the poem is becoming a combination of true events with the truth of the poem: even though I changed the number of years since her death, the truth of what she means to me has become stronger. On November 29, I revised the poem again, and this time the rhythm became more consistent. STONES, pink QUARTZ, SQUARES of SHATtered CONcrete. I CANnot FIND the PLOT of EARTH that BEARS her NAME. Of course when the poem is read aloud, the emphasis on these syllables isn’t as pronounced. In each of several 2010 drafts, I made the lines longer, so the poem became more truly a prose poem, more like a conversation or a reflection than a rhyming poem. I removed the space that had previously divided the poem into two stanzas because I felt it had become more like a soliloquy, the act of speaking one’s thoughts aloud as if one is alone. 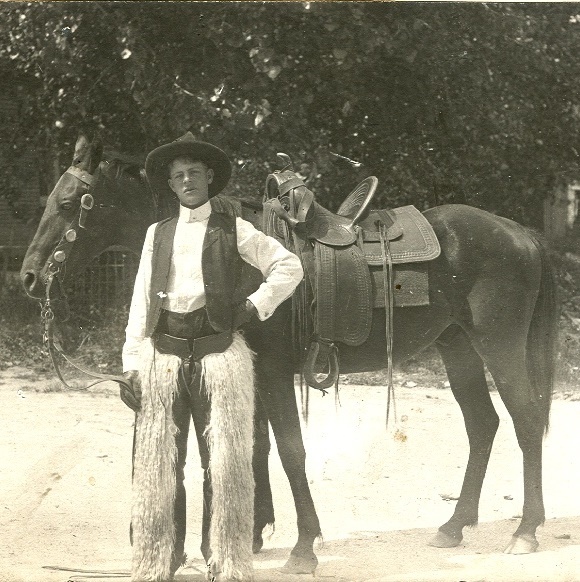 Elmer Baker, the grandfather I never knew. He died when my mother was just a girl. Working on the poem made me recall more details of her life. I had known that her husband was killed in a “logging accident” near Mount Hood, OR, but years later I obtained his death certificate and discovered that he was beheaded when he fell under a train. My grandparents had married in Wheatland, WY, where her family had moved after living in Oklahoma for “a spell,” as she put it. After Elmer was killed, grandmother moved back to Wheatland with her two babies, my mother and her brother. Grandmother later told me that the railroad gave her $100 and a ticket to anywhere she wanted to go as compensation for his death, since there was no insurance. His brother borrowed the money from her, so, short of funds, she moved to Edgemont, SD, another train town, and opened a “dining room” with her sister Pearl. Later, she married a local mechanic, and when he was given a small ranch in payment for a debt, moved with her two children to the ranch where she and her second husband had two more boys. 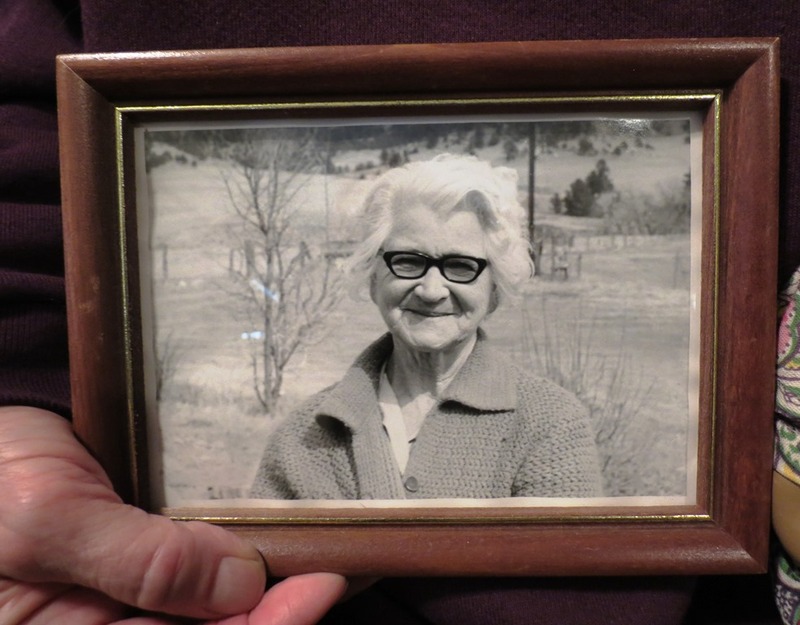 Her second husband dropped dead beside her after pitching off a load of hay to their cattle. Writing up the poem conjured grandmother so completely in my mind that I remembered how I had recalled that small fact about the dining room as I looked from the cemetery hill down over the little town. And that memory somehow told me where to look for her in the cemetery. The final line becomes the success of the poem and my search. As I worked through the drafts, changing the title by removing Grandmother’s name, I had finally concluded that it would be more effective if, as I searched, I kept her name to myself until I found her. Perhaps the reader would think of her own grandmother until her name rings out as part of my discovery of her grave in the final line. I inserted “lotion” both because I was using her hand lotion, and for the line’s rhythm; the line would not scan as well if I’d written “lotion and bars of soap,” but the phrasing makes it sound as if I’m using up “bars” of lotion. I should have placed a comma after soap. This is the poet’s life: revise and revise and revise again several times after you think the piece is finished. Knowing when to stop revising is a different problem! 4 but cannot find the plot of earth that bears her name. 5 And yet I greet her every day in my own kitchen. 22 there she is: just below the water tower. 23 The dusty stone reads Cora Belle. Published in Dirt Songs: A Plains Duet, with Twyla M. Hansen, The Backwaters Press, 2011.